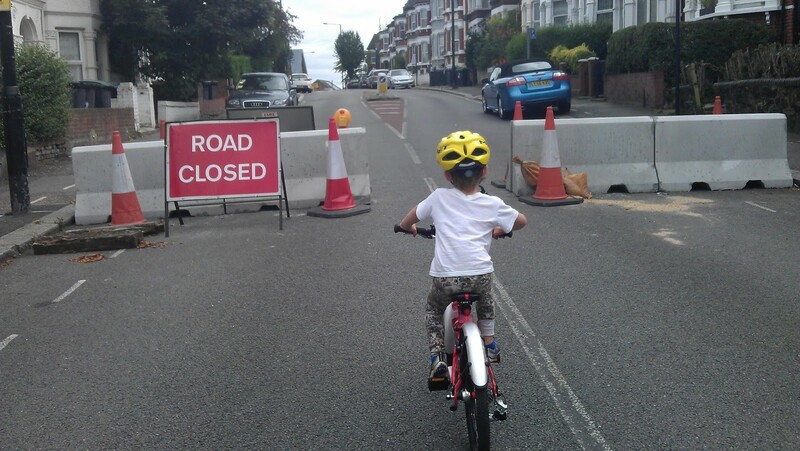 Support Wightman Road filtering – complete the council survey by this Sunday 14 May! Last summer extraordinary things happened in one part of Haringey. It was a summer of fun for kids: on roads and streets where before there was only bad air and road traffic noise, now there was the sound of kids playing out. Street football was a daily occurrence, children were using the road to cycle to school and there was even the occasional lemonade stand. It wasn’t just children who were joining in with being more active. Adults across this large area realised they didn’t really need the car for their shorter journeys – walking was nearly as fast and made them feel pretty good now the air was cleaner. Cycling to Finsbury Park to pick up the tube was quicker than the bus and nicer than cramming onto the packed trains, and getting there on a bike suddenly seemed easy now the journey could be done mostly without having to ride with speeding traffic. Surely this was all the work of a council fully committed to the health of their residents, the sort that would make bold claims about making their borough the most liveable in London? Sadly this utopia did not last. While other boroughs nearby were permanently closing roads to through traffic to entrench a new, healthier lifestyle in their boroughs, Wightman Road and its adjoining roads were reopened as through routes for motor traffic. The weekend bike rides to the park had to stop. ‘I’m sorry. There’s no safe way to cycle there now’. As a cycle campaign we are of course primarily interested in high quality provision for cycling that allows anyone to feel confident using a bike to get around. This has been the focus of our continuing engagement in the Green Lanes Area Transport Study. There are many ways to achieve this but many options that improve conditions for people on bikes also have much wider benefits for those in the area – even if they never cycle. For example making areas more healthy and liveable, reducing air pollution and even reducing journey times for drivers by lowering overall traffic levels and simplifying routes. If you live in or travel through Harringay or the Green Lanes area, you have until Sunday to complete the council survey on future options for Wightman Road and the surrounding area. We believe this is an issue primarily for local people to decide, so please take a look at Living Wightman’s advice on how to complete the survey. While some of the options presented can deliver a suitable cycle route (in particular we recommend you support the proposal for a northbound cycle track on Green Lanes, desperately needed in an area with no safe north/south routes), the option to ‘filter’ Wightman Road will deliver multiple health and air quality benefits as well as a safe route suitable for all-ages cycling. Many parts of this borough are already ‘filtered’ to through traffic. Other boroughs which are right next to Haringey are showing how such schemes, if well managed, can reduce traffic over a wide area. The use of Wightman Road as a conduit for through traffic has negative consequences for the areas to the north and south that also have long-standing issues with excessive through traffic. The council’s response to the issues encountered on Wightman Road is a real test for them – are they serious about tackling pollution and unlocking the massive potential for active travel in this borough? Or, as suggested by the recent consultation on the Wood Green AAP, is the future of our borough just as polluted, congested and unhealthy as our present? This is your chance to tell the council what sort of place you want this borough to evolve into. Don’t miss the chance to have your voice heard.